Lakeway Drive roastery to offer an up-close coffee roasting experience, coffee bar, and Cold Brew production. We’re proud to offer the area’s most advanced coffee roasting and cold brew facility. 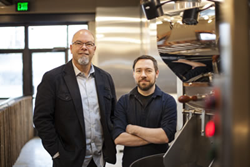 Woods Coffee today announced its plans to open a public coffee roasting experience on March 28, at its Lakeway Drive location in Bellingham. The new Woods Coffee Roastery will be an extension of its existing coffee shop at 813 Lakeway Drive, offering a first-hand experience of the coffee roasting process, a coffee brew bar, and specialty coffee drinks not offered at other Woods locations. With this move, Woods will relocate a majority of their coffee roasting from Lynden to Bellingham. Woods will begin roasting on the company’s state-of-the-art 35-kilo Loring Smart Roast roaster. Loring uses a proprietary closed-loop roasting process that eliminates the need for an afterburner, producing a cleaner, brighter cup of coffee. With no need for an afterburner, Loring roasters reduce greenhouse gas emissions by up to 80 percent, compared to other roasting manufacturers. Woods is also introducing streamlined production practices at its new roastery. The company created custom bag-lifting equipment and handling processes, as well as a sophisticated Cold Brew production system, made of large stainless steel tanks, which will produce all of the popular Cold Brew coffee enjoyed at its 17 Pacific Northwest locations. “We’re proud to offer the area’s most advanced coffee roasting and cold brew facility,” said Herman. Woods will use the new La Marzocco Strada espresso machine to create specialty espresso drinks at its new roastery. The Strada is a custom-designed machine to fit Woods’ style and to allow more personal interaction. Single-origin pour overs prepared one cup at a time will be served using advanced methods to ensure excellent coffee every time. Woods has added extra space for guests to accommodate what it hopes will become a coffee enthusiast destination. Starting March 28, the new Woods Coffee Roastery will be open from 8:00 a.m. to 2:00 p.m., Monday through Sunday, and will be staffed by Woods’ team of roasters and hand-picked master baristas. The existing Woods Coffee shop on Lakeway Drive will continue serving guests during its normal hours: 4:30 a.m. to 10:00 p.m., Monday through Saturday, and 6:00 a.m. to 9:00 p.m. on Sundays. For more information on Woods Coffee, visit WoodsCoffee.com, check out the company’s Facebook page, or call 360.933.1855. Woods Coffee was established in 2002 by the Herman family of Lynden, Washington. With a dream of starting a chain of coffee shops, the Herman family pooled their talents and resources to create their first Woods Coffee shop. Today, 14 years later, the company has a total of 17 locations in the Pacific Northwest; offers its own line of fresh, in-house baked goods; roasts all of its own coffee; and offers an exclusive compost-a-cup brand of compostable cups. In addition, the company uses sustainable design and building practices, using LEED® standards where possible. For more information on Woods Coffee, please visit WoodsCoffee.com, or call 360.933.1855.